Thanks to Dennis Wilkins and Jonathan Sachs for excellent suggestions and extensive proofreading. Carlos E. Mora's two-part Spanish translation: Los modelos y espacios de color (II) Gesti�n del color y la ciencia del color: Introducci�n | Las Bases de la gesti�n del color. improve the color match between your monitor and printer. work with fine art papers or nonstandard inks, for example, archival pigment-based inks from independent manufacturers. send out an image to be printed, for example, on a large format LightJet printer. reproduce color as precisely as possible-- for example, for fashion, weddings, or art reproduction. To meet these goals you'll need to get involved with the set of software packages and procedures known as color management. There's a learning curve, but it will ultimately simplify your workflow. The series begins with an Introduction to color management and color science (this page). Implementation part 1 describes how to set up color management and interpret the contents of ICC profiles (files that describe the color response of a device or a color space). It features Picture Window Pro, but includes information on Photoshop. Implementation part 2 discusses monitor profiling and workflow details. The series continues with Obtaining ICC profiles and building them with MonacoEZcolor and Evaluating printers and ICC profiles. CIE Fundamentals for Color Measurements by Yoshi Ohno, Optical Technology Division, NIST. An excellent review of CIE colorimetry from an IS&T technical conference. Describes the CIE 1931 (x, y) and 1976 (u’v’) diagrams. 101 Color Resources for Web Designers by Jimmy Atkinson. An excellent up-to-date set of links, with comments. Color Management for Photographers Excellent introductory articles from Digital Outback Photo. Why Color Management? by James C. King of Adobe. Danny Pascale of Babelcolor has produced some outstanding tutorials with real technical depth. Especially recommended: A review of RGB color spaces: "The complete process between spectral data and RGB coordinates, from xyY to R'G'B', with a section on the various TV and multimedia display standards." Articles by Bruce Fraser in Creativepro.com. In-depth articles, elementary to advanced. Jonathan Sachs' tutorial on Color Management, required reading for Picture Window Pro users. Color Management for Dummies... A nice introduction from Digital Focus, geared for digital camera users. Also has related articles. Inside color management The latest on what color management is, how it works, and what tools are available. David Broudy, Electronic Publishing, June, 2001. A nice thoughtful article on the RIT website. Representing color A concise introduction to color science, part of a course on Advanced Computer Graphics, taught by Phillip J. Willis at the University of Bath in the UK. 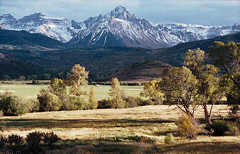 PhotoShopNews.com Excellent source of news and information on color management and digital techniques; not for Photoshop users only. The ColorShop Color Primer: an introduction to the history of color, color theory, and color measurement by Fred Bunting, Light Source Computer Images, Inc., an X-Rite Company. A 116 page PDF document-- a complete textbook in itself. Links from the Colour Imaging Group, School of Printing and Publishing, London College of Printing. A very nice set of references. Scott Martin - On-Sight Color management consulting and training and remote profiling. Real World Color Management: Industrial-strength production techniques, by Bruce Fraser, Fred Bunting, and Chris Murphy. Paperback, 560 pages. The closest thing to a Color Management Bible. Buy it if you want to go into real depth. But as its subtitle "Industrial-strength production techniques" indicates, much of the material covers prepress applications (CMYK, etc. ), which are of only indirect interest to photographers. Mastering Digital Printing: The Photographer's and Artist's Guide to High-Quality Digital Output, by Harald Johnson. Paperback, 400 pages. Perhaps more for artists than photographers, it has a good introduction to color management. Color Science: Concepts and Methods, Quantitative Data and Formulae, by G�nther Wyszecki and W. S. Stiles. Paperback, 968 pages. A collection of scientific review papers-- not for the casual reader. This is the reference I use to verify questionable statements on color and color management in popular literature. It's the source. The retina of the human eye has two categories of light receptor: rods, which are active in dim light and have no color sensitivity, and cones, which are active in bright light and provide us with our ability to discriminate color. You probably learned that the three types of cone are sensitive to red, green, and blue (R, G, and B). Close, but no cigar. The relative sensitivity of the three receptors for the "normal" human eye, designated by Greek letters beta, gamma and rho (β, γ, and ρ), is illustrated by the blue, green, and red curves on the right. Although the beta and gamma sensors correspond closely to blue and green, the rho sensor (the red curve) isn't even close to red. An ink with the same reflectivity spectrum would appear yellow-orange. The eye/brain discriminates color by processing the relative stimuli in the three sensors. R, G, and B are used as additive primary colors because their distribution across the visible spectrum produces a wide-gamut color image, not because they match the eye's response. Fewer than three colors is insufficient. Additional colors offers some advantage-- that's why recent inkjet photo printers have 6 to 8 colors. Combining three colors-- even monochromatic (spectrally pure) colors produced by lasers-- can produce most, though not all, of the colors the eye can see. How is this known? A set of experiments is run using a split screen. Half is illuminated by a monochromatic light source with variable wavelength. The other half is illuminated by an adjustable combination of red, green and blue, which can be produced by lasers or by filters, which have a broader spectrum than lasers. If the two halves of the screen can be matched with some combination of the R, G, and B lights, then the color of the pure monochromatic light is within the gamut of colors defined by the three light sources. If no match is possible-- if white light must be added to the monochromatic source to provide a match-- then the color of the monochromatic source is out of gamut. This experiment shows that no combination of three real light sources can duplicate the full gamut of human vision. Monitors with three phosphor colors (RGB) have limited color gamuts; printers with four ink colors (CMYK = cyan, magenta, yellow, black) have even smaller gamuts. Printers with additional colors-- 6 to 8 are not uncommon-- have larger gamuts. The eye's peculiar response has consequences for the discipline called color science, which has arisen to quantify human vision. A detailed exposition would overwhelming, but a few aspects, which are widely discussed but poorly understood, are important for color management. How to purchase prints . An excellent opportunity to collect high quality photographic prints and support this website . 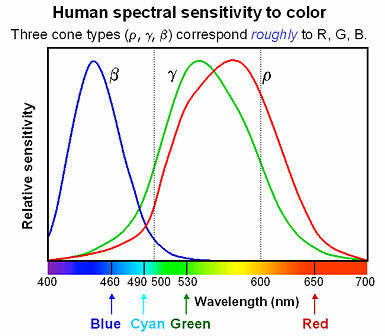 In order to quantify human color vision, the CIE (Commission Internationale de L'�clairage) has established a set of imaginary "red," "blue," and "green" primary colors that, when combined, cover the full gamut of human color vision, i.e., a combination of the three can match any monochromatic light source. These color primaries (shown on the left) have a curious property-- they have negative energy in portions of their spectra, i.e., they are not physically realizable. efg's (Earl F. Glynn's) Chromaticity Diagrams Lab Report. The combinations of these three "light" sources required to match monochromatic (spectral) light are determined experimentally (by performing mathematical matrix transformations of the results of the split screen matching experiment). The curves for these combinations, shown on the right, are called the Color Matching Functions for the Standard Colorimetric Observer. They are designated x�, y�, and z�, and they never have negative values. Example: 450 nm monochromatic light can be matched with x� = 0.34, y� = 0.04, z� = 1.77. The Color Matching Functions are used to derive the XYZ Tristimulus Values that uniquely define an object's colorimetry; two objects with the same tristimulus values have identical color appearance when viewed under the same conditions. The X, Y, and Z tristimulus values are calculated by integrating (summing) the product of the spectral reflectivity, the illuminant (the light source), and the corresponding color matching function from 380 to 700 nanometers (nm). Although the tristimulus values uniquely define an object's color, they do not define the eye's response to the color, which depends on the environment and the eye's adaptation. If two objects with different spectral reflectivities have the same color appearance (tristimulus values) under one light source, they are said to be metamerically matched. If they exhibit a marked difference under another light source (as with two pieces of cloth that look identical in a shop but different outdoors), they suffer from viewing illuminant sensitivity, frequently called metamerism. (This definition is misleading, but it has become so prevalent I won't try to fight it.) This phenomenon is most visible with neutral colors (grays). It is a problem with many color printers, particularly with Black & White prints; it was particularly severe with the Epson 2000P, but newer printers (2005 and later) have largely solved the problem. In actuality, metamerism, properly defined, is not a bad thing: it enables a combination of just a few inks to take on the colors of a wide range of objects. is widely used but not perceptually uniform; it overemphasizes greens. XYZ tristimulus values are important because they form the basis of the familiar but often misunderstood CIE 1931 chromaticity diagram, shown on the right. This diagram is based on normalized tristimulus values, x, y, and z, where, x = X/(X+Y+Z), y = Y/(X+Y+Z), and z = Z/(X+Y+Z). This normalization (division by X+Y+Z) removes the brightness from the diagram so that only two coordinates, x and y, are needed to define chromaticity. z = 1-x-y would be redundant. Since Y is closely related to perceived luminance, colors are sometimes expressed as xyY tristimulus values. 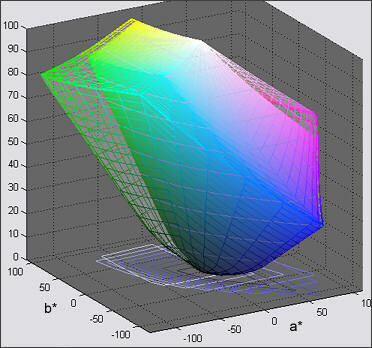 The colors in the diagram are not accurate, but the representation produced by Gamutvision is about as good as can be obtained with the limited color gamut of a computer monitor. The 1931 chromaticity diagram is not without its flaws. The distance between just noticeable color differences (called ΔE) is much greater in the green region on the top than at the bottom; it is not perceptually uniform. For this reason, CIE has defined additional color spaces, particularly CIELUV (1976) and CIELAB (1976), which represent colors more uniformly. But the 1931 diagram persists because of historical inertia. All the CIE color spaces encompass the full gamut of human vision and all are device-independent. Bruce Lindbloom presents the equations for converting between them. But unlike RGB color spaces, they aren't intuitive. The precise meaning of their coordinates is difficult to visualize and they contain values outside the gamut of human vision. Hence they aren't used as working color spaces for image editing. They play a vital but invisible roll in color management; you don't need to understand their details to manage color effectively. Image produced by Gamutvision. . The CIE 1931 chromaticity diagram is used to illustrate the gamut of a device or a color space-- the range of reproducible colors generated by a specific set of primaries. (Color space profiless also include a specification for gamma and white point.) For three-color additive devices, gamut is defined by the triangle formed by the x, y chromaticity values of the Red, Green and Blue (RGB) primary colors. Colors inside the triangle can be reproduced; colors outside can't; they are out of gamut. The above figure on the right illustrates the gamut for the sRGB color space. sRGB was designed to match the gamut ot a typical monitor with gamma of 2.2 and white point set to 6500K (D65). It is the de facto standard for the Internet and the Windows operating system. The gamut of sRGB, shown on the right inside the gamut of Adobe RGB (1998), is quite limited. It maintains a distance from the line of purples and is weak in green and cyan, although this weakness is greatly exaggerated by the distortion of the 1931 diagram. In monitors, the gamut is limited by the phosphors, which are chosen for brightness, longevity, low cost, and low toxicity. Ideal phosphors-- with colors located near 450, 520 and 650 nm on the spectrum locus-- don't exist. Most monitors with P22 phosphors have similar gamuts. Printers, whose colors are based on variants of CMYK (cyan, magenta, yellow, black) subtractive primaries, have gamuts whose shape is more complex than a simple triangle-- often somewhat hexagonal with additional vortices at the Cyan, Magenta, and Yellow primaries. Because inks have imperfect spectra and are somewhat opaque, dark or light colors tend to have smaller gamuts than middle tones. Most four-color CMYK printers have smaller gamuts than monitors, but high quality inkjet printers with more than four colors (typically with the addition of light C and light M) may have larger gamuts. Color slide films have considerably larger gamuts. Now we approach one of the key issues in color management: How is color represented in computers? We focus on RGB color spaces because they are used for digital image files, and there are a good many of them. Other color models (CMYK, HSV and HSL) are discussed elsewhere on this site and in Microsoft's MSDN library. In 24-bit RGB color spaces, color is described by three 8-bit bytes, each of which can take on values 0 through 255. Pure red is (255,0,0), green is (0,255,0), blue is (0,0,255), black is (0,0,0), and white is (255,255,255). Some programs like Picture Window Pro and Photoshop CS can utilize 48-bit color that allows values of 0 through 65,536 for each primary color. 48-bit color eliminates banding that can occur when colors are adjusted in the 24-bit mode. unless they are associated with a color space. But what exactly is meant by "pure" R, G and B? For a given color space, "pure" R, G and B are the primary colors, located at the apexes of the gamut triangle: R on the right, G on the top, and B on the left. To accommodate the wide range of gamuts in different devices-- digital cameras, film, scanners, monitors, and printers, a variety of color spaces has been developed. The de facto standard for the Internet and Windows, sRGB, has a limited gamut corresponding to a typical CRT monitor. Other color spaces have larger gamuts-- corresponding roughly to high quality printers or to film. Some have extremely large gamuts, covering most of the colors the eye can see and some it can't. Maintaining consistent color appearance in the translation between different devices and color spaces is no easy task; color management provides a reasonably sane and practical solution. But it's is no panacea. Even the most sophisticated system can't make two devices with different gamuts display exactly the same colors; it can't make a monitor or CMYK printer display Velvia-saturated colors. The diagram below, taken from Jonathan Sachs' excellent tutorial on Color Management for Picture Window Pro, is a simplified illustration of a color-managed workflow. (See Implementation part 2 for a detailed diagram.) Programs that utilize color management are described as being ICM-aware, where ICM stands for Image Color Management. ICM standards are maintained by the International Color Consortium. In a color-managed workflow, the color response of each device, each image file, and each image in the computer's active memory is characterized by a file called an ICC profile. ICC profiles have the extension ".icm" and are stored in specific locations on Windows computers. You may need to do some bookkeeping in these folders because problems can arise (especially with pre-XP versions of Windows) when more than about 30 profiles are present. Since profiles are loaded by profile creation programs such as MonacoEZcolor, Windows itself, image editors, and device drivers, they can easily proliferate. I recommend creating a folder called "Unused profiles" for profiles you don't use. If nothing else, it will shorten the drop-down lists. You can obtain a printout of profile descriptions from Picture Window Pro by clicking on File, Color Management... to bring up the Color Management dialog box, then clicking Print Profile List... ICC profiles can also be embedded as tags within image files: TIFF, JPEG, PNG, and BMP are supported by most ICC-aware image editors. ICC Profiles consist primarily of tables that relate numeric data, for example, RGB (222,34,12), to colors expressed in a device-independent CIE color space called a Profile Connection Space (PCS)-- either CIE-XYZ or CIELAB. The colors may be the objects sensed by a scanner or produced by a printer or monitor. They can also refer to one of the numerous color spaces. Monitor profiles have the same format as color space profiles. Profiles may contain additional data, such as a preferred rendering intent and gamma, Monitor profiles often contain instructions for loading video card lookup tables, i.e., for calibrating the monitor. The heart of color management is the translation or gamut mapping between devices with different color gamuts and files with different color spaces. Mapping functions are shown in the yellow boxes in the illustration, above. They are performed by a Color Matching Module or Method (CMM), also called a Color Engine, using data in the profiles. The CMM combines the input and output profiles, both of which are referenced to a PCS, to perform a direct conversion between the devices or color spaces. It interpolates data in printer profile tables, which would be prohibitively large if all possible color values were included. Picture Window Pro uses either the Windows default color engine, ICM 2.0, or an alternative engine, LittleCMS. Adobe Photoshop has its own color engine, ACE. Color engine mappings may be called from ICM-aware programs or device drivers. You must be aware of where the translation takes place in your environment. If you are careless, mapping can take place twice (or not at all), with undesirable results. We will show examples. For reference, ColorSync is Apple's color engine. 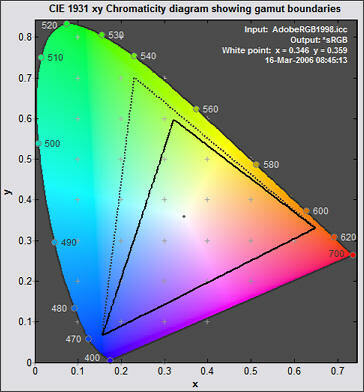 ColorMatch RGB is Apple's default color space, with gamma = 1.8 and gamut between sRGB and Adobe RGB (1998). Apple RGB is an older color space with a narrower gamut. Easy to get confused. Gamut mapping is performed with one of the four rendering intents (gamut mapping algorithms) recognized by the ICC standard and by Windows ICM 2.0. The rendering intent determines how colors are handled that are present in the source but out of gamut in the destination. Since there are several nomenclatures for gamut mapping, I use a color code to distinguish the sources: ICC, Windows ICM 2.0, Picture Window Pro. I'll generally stick with the ICC nomenclature. Perceptual, also called Picture or Maintain Full Gamut. This is PW Pro's default, and is generally recommended for photographic images. The color gamut is expanded or compressed when moving between color spaces to maintain consistent overall appearance. Low saturation colors are changed very little. More saturated colors within the gamuts of both spaces may be altered to differentiate them from saturated colors outside the smaller gamut space. In the diagram on the right, the left and right of the color space blocks represents saturated colors; the middle represents neutral gray. Perceptual rendering applies the same gamut compression to all images, even when the image contains no significant out-of-gamut colors. Bruce Fraser points out that for an image with unsaturated colors, e.g., with pastels, Relative Colorimetric rendering may produce a slightly more accurate result. 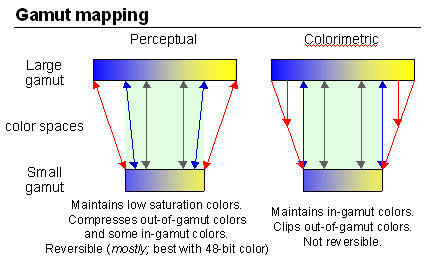 Perceptual gamut mapping is mostly reversible; it is most accurate in 48-bit color. None of the other rendering intents is reversible. Relative Colorimetric, also called Proof or Preserve Identical Color and White Point. Reproduces in-gamut colors exactly and clips out-of-gamut colors to the nearest reproducible hue. Not reversible. See diagram. Bruce Fraser says, "Look at the relative gamuts of your source and destination: The same image may need different rendering intents for different output process. For example, an image might benefit from perceptual rendering when printed to an inkjet printer, but when the same image is going out to the much larger gamut of a film recorder, relative colorimetric rendering might work much better. If an image doesn't contain any important strongly saturated colors, you'll probably get a better result using relative colorimetric rendering than you would using perceptual." Absolute Colorimetric, also called Match or Preserve Identical Colors. Reproduces in-gamut colors exactly and clips out-of-gamut colors to the nearest reproducible hue, sacrificing saturation and possibly lightness. On tinted papers, whites may be darkened to keep the hue identical to the original. For example, cyan may be added to the white of a cream-colored paper, effectively darkening the image. Rarely of interest to photographers. Saturation, also called Graphic or Preserve Saturation. Maps the saturated primary colors in the source to saturated primary colors in the destination, neglecting differences in hue, saturation, or lightness. For block graphics; rarely of interest to photographers. Rendering intents don't always perform according to the textbook description. You can view their actual performance with Gamutvision— a powerful utility written by the author of this tutorial. ICC profiles reference the CIE device-independent color spaces-- CIEXYZ and CIELAB. When gamut mapping is performed, tables from the source and destination profiles are combined; gamuts are mapped directly. This minimizes loss of image quality. More on rendering intents can be found in articles from Microsoft, ProfileCity.com and Bruce Fraser. Gamut mapping links (for geeks) Gamut mapping is a complex topic, particularly for Perceptual rendering intent. The details of the are contained within the profile. There are a great ways of performing Perceptual rendering. Here are some highly technical papers, guaranteed to generate more questions than they answer. Like what techniques are actually used in your profiles? This doesn't sound anything like the familiar "you push the button, we do the rest" marketing hype. Gustav J. Braun and Mark D. Fairchild: General-Purpose Gamut-Mapping Algorithms: Evaluation of Contrast-Preserving Rescaling Functions for Color Gamut Mapping, Munsell Color Science Laboratory, RIT. More about Mark Fairchild. Ethan D. Montag and Mark D. Fairchild: Gamut Mapping: Evaluation of Chroma Clipping Techniques for Three Destination Gamuts, Munsell Color Science Laboratory, RIT. ICC profiles: files that define the meaning of numeric color image data, i.e., RGB = (17, 44, 227). Profiles can define color in devices (scanners, digital cameras, printers, etc.) or image color spaces. All digital images refer to a color space-- either explicitly via an embedded or user-specified profile, or implicitly: Windows assumes sRGB color space is none is specified. from one color space to another. from an image in memory to a monitor. from an image in memory to a printer. How to build or obtain profiles. How to evaluate their quality. How to set up workflows to utilize them properly. What working color space to choose. How to deal with images that don't have embedded profiles. What rendering intent(s) to choose for "reasonable" color rendition. Most importantly, how to get the best subjective match between the monitor image and the print. We'll deal with these issues in the remainder of this series.